Incredible footage of Longear Sunfishes from the Youtube channel of Brandon Brown! Spring is upon us, and it’s that time again when some aquarists among us start thinking about the fishes that swim in our local rivers, streams, ponds and lakes. With good reason too, because our North American native fishes can, at times, rival the most brilliant reef fishes and freshwater dazzlers. 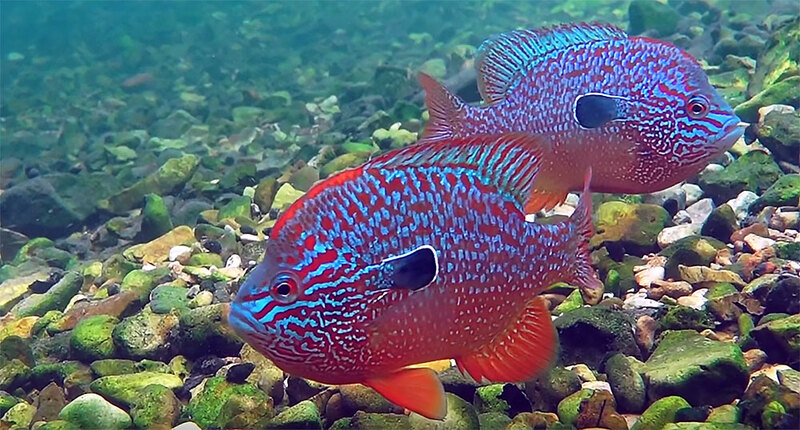 This video, published by Brandon Brown, hits that point home showing off two stunning favorites during breeding season; Longear Sunfish (Lepomis megalotis) and Cardinal Shiners (Luxilus cardinalis). At this point, if you’re not wanting to add a natives tank to your fishroom…we’re probably not doing our jobs! Now, it’s worth mentioning that the husbandry of sunfishes is reportedly challenging at times; one look at those cartwheeling males should hint at the potential for aggression, particularly in mature and breeding Sunfishes. Zimmerman’s Fish, a producer of native fishes that sells into the aquarium trade, suggests that the Longear Sunfish is best kept in groups of 6 or more (presumably to spread aggression out), or singly. At an adult size of 6-8 inches (15-20 cm), that should tell you that a 20 gallon, or possibly even the standard 55, might not be enough space! As we always remind our readers; the keeping of native fishes often has specific local and state rules; we encourage you to acquaint yourself with the laws in your state before you go collecting or purchasing these fishes. We just found this second video of Longear Sunfish, again shot by Brandon Brown!